1. How long is the flight from the U.S. to Ghana? A direct flight from New York (JFK) to Accra, Ghana (ACC) takes approximately 10 hours, 45 minutes. An itinerary that connects through Europe will take approximately 17 hours total, including layover(s). 2. Does the group fly to Ghana together? Due to the fact that program participants are coming from all over the world, it is not feasible to book airfare as a group. Everyone is responsible for booking her/his flight according to specific schedule criteria. 3. How does airport pickup in Ghana work? Kotoka Airport (ACC) in the capital city of Accra is Ghana’s only international airport. ThisWorldMusic’s on-the-ground staff collects program participants at the airport and transfers them to the hotel for the start of the program. 4. What will I need to pack? For helpful packing tips, read Top 10 Things to Pack for Study Abroad in Ghana. A more complete packing list is provided to all enrolled participants. 5. What vaccinations/immunizations are needed for travel to Ghana? For the best and most up-to-date information on what vaccinations/immunizations are needed for travel in Ghana, all program participants are required to visit a travel clinic. A travel doctor will know the current Centers for Disease Control recommendations for every country, including Ghana. 6. Is the water in Ghana safe to drink? The water in Ghana is not considered potable by Western standards. Included in the program fee is unlimited bottled water for the time the group spends living and studying at the Dagbe Cultural Institute. On travel days, program participants are responsible for purchasing bottled water. 7. What is the security situation like? Ghana is one of the safest, most well-developed countries in Africa. There are no known terrorist groups operating in the country and very little anti-Western sentiment. Our team keeps up-to-date through our extensive network of contacts on the ground there, as well as through our member subscription to the daily regional bulletin put out by the U.S. State Department’s Overseas Security Advisory Council (OSAC). 8. What language is spoken in Ghana? English is the official national language of Ghana. In addition, there are nine government-sponsored languages of African origin spoken in Ghana. Students who are interested may have the opportunity to study two of these languages, Twi and Ewe. 9. What is the weather like? The Summer Sessions take place at the tail end of Ghana’s main rainy season. 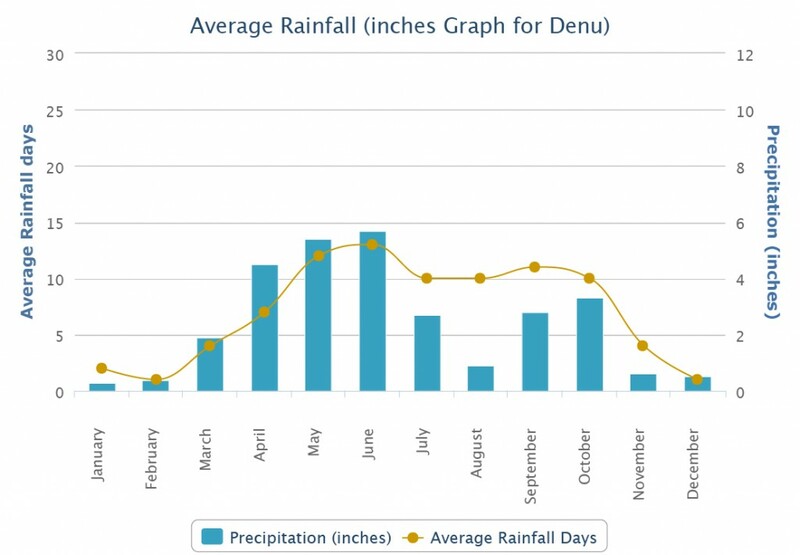 The rain this time of year is sporadic and mostly late at night; the weather is relatively cool. 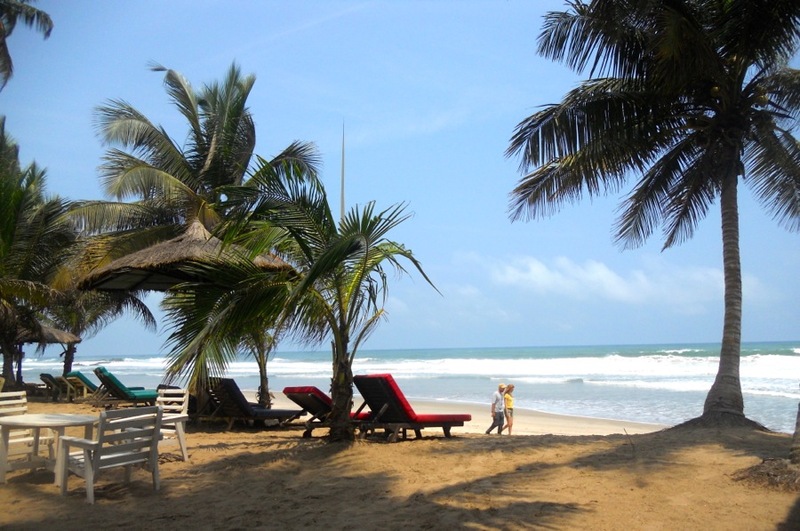 Many people feel this is the best time of year to visit Ghana. The Winter Session occurs during Ghana’s dry season, which some people prefer due to the reduced mosquito population. 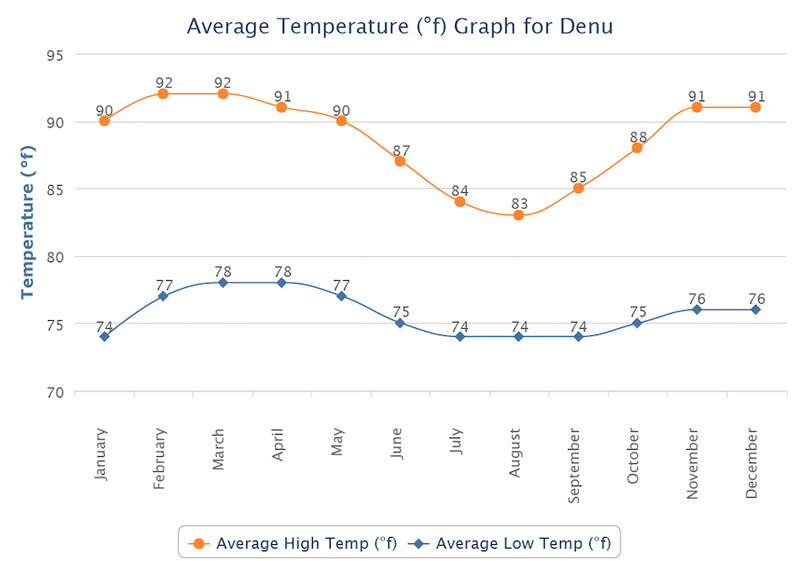 The temperature is still relatively cool compared to other times of year. 10. What type of insurance will I need? ThisWorldMusic LLC is insured for all foreign and domestic operations. All of our program participants are automatically enrolled, free of charge, in West African Rescue Association (WARA), a private air/ground ambulance service and health services provider based in Ghana. In addition, all participants are required carry both basic health insurance and short-term international travel health insurance. 11. Is there phone or Internet access during the trip? All program participants are provided a complimentary mobile phone for use in Ghana, where network service can be adequate, even in some rural areas. There is wireless Internet available at the Afia Beach Hotel in the capital city of Accra. There is also intermittent Internet access at the Dagbe Cultural Institute, though connection speeds vary. 12. Who is eligible to apply for the Study in Ghana program? Enrollment is open to students and professionals worldwide, as well as to the general public. You do not need to be a matriculated student at UMass Amherst or any other college or university to be eligible to apply. 13. What type of course credit is available? All Ghana programs are 500-series courses (i.e., eligible for graduate credit) accredited through the University of Massachusetts Amherst Department of Music & Dance. Everyone who attends the program and completes the final project receives 6 academic credits (undergraduate or graduate) for the 3-week summer program, and 3 academic credits (undergraduate or graduate) for the 11-day winter program and 11-day summer program. If desired, the graduate credits can be converted into equivalent professional development credits (PDPs, CRUs, PLUs, CEUs, etc.). 14. Are there online reviews of the program? 15. I have no drumming or dancing experience. Does that matter? No prior drumming or dancing is necessary to attend the Study in Ghana program. The instructor to student ratio at the Dagbe Cultural Institute, where the group lives and studies, is approximately 1:1, easily allowing instruction to be differentiated to accommodate all levels of skill and experience. 16. I am a professional drummer/dancer. Will the curriculum be challenging? The instructor-student ratio at the Dagbe Cultural Institute, where the group lives and studies, is approximately 1:1, easily allowing instruction to be differentiated to accommodate all levels of skill and experience. All of the Dagbe Institute’s staff instructors are world-class musicians and teachers and we frequently have top-flight professional drummers and dancers attend the program. 17. What are the application deadlines? Admission on all ThisWorldMusic Ghana programs is rolling. Enrollment is on a first-come, first-served basis. 18. How do I apply? To apply for all programs, click here. 19. What is the average age of attendees? The age range of a typical program is 18-65 years old. Most of our groups tend to be an intergenerational, interdisciplinary mix of undergraduate students, graduate students, professors, performers, K-12 teachers and community members. While many participants come from the field of music or dance, we do have many ‘non-artists’ who attend as well. 20. 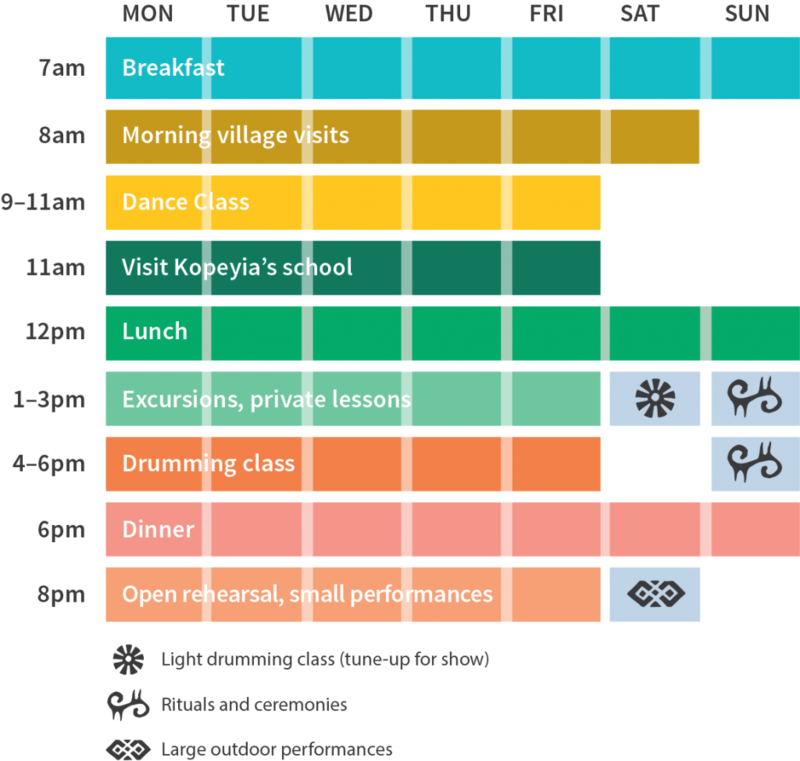 What is a typical day like at the Dagbe Cultural Institute? 21. How much interaction does the group have with locals? The Dagbe Cultural Institute, where the group lives and studies, is located in the village of Kopeyia. Both the Dagbe Institute and Kopeyia are very secure, allowing for constant interaction between program participants and locals. All staff instructors at the Dagbe Institute are residents of Kopeyia, and the group frequently spends time in and around the village, observing and participating in the rituals of daily life. 22. What is health care like? All of our program participants are automatically enrolled, free of charge, in West African Rescue Association (WARA), a private ground/air ambulance service. In the event of a health emergency, WARA liaises with the participant’s international travel health insurance company to quickly find the best level of care. In addition, ThisWorldMusic works closely with Dr. Adrian Oddoye, the Post Medical Advisor for the U.S. Embassy in Ghana. 23. What is housing like? 24. What is the average group size? The enrollment cap for all Ghana programs 20 participants. On average, our programs have 10-20 participants. 25. What is covered by the program fee? 26. How does payment work? The $750 non-refundable program deposit is due no more than 14 days after the participant’s date of acceptance. The remaining balance is due no more than 60 days after the participant’s date of acceptance. No refund of the remaining balance – if participant withdraws from the trip 60 days or less than 60 days before program start date. 27. What forms of payment are accepted? We accept the following forms of payment: check, credit card and wire transfer. There is a 2.5% transaction fee when paying the remaining balance by credit card (3% for American Express). As a courtesy, this charge is waived on the initial $750 non-refundable deposit. 28. Are there scholarships available? At this time, neither ThisWorldMusic nor UMass Amherst offers scholarships for the Study in Ghana program. ThisWorldMusic does offer customized tuition payment plans. Applicants in need of financial assistance are encouraged to seek outside funding sources. 29. Are there payment plans available? ThisWorldMusic offers customized monthly payment plans. For more information, contact us.